I stood in the middle of a large room in the Brewster Ladies Library, surrounded by dogs. Yes—in the library. Six dogs sat around the room, patiently, as if they had read a sign that said Quiet Please. But the kids trickling into the room were too excited to be quiet. Kids reading to dogs: that’s the idea behind Tales to Tails, an event which takes place at libraries across the country. 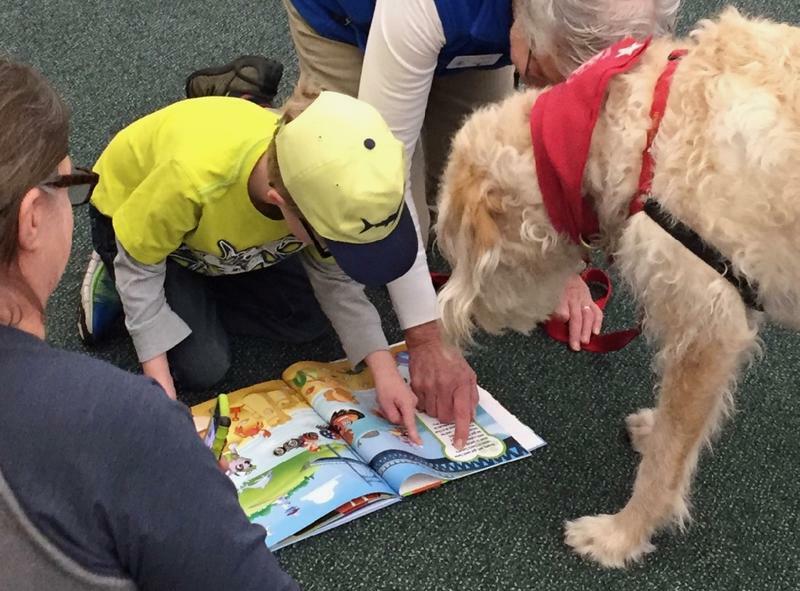 Here on the Cape, the event is organized by the Companion Animal Program, a nonprofit that trains regular people—and their dogs—to spend time in nursing homes, hospitals, schools, and of course libraries. The kids gathered around a bookshelf, plucking out titles like, “The Three Little Pugs.” As they approached the dogs with a book or two in hand, the owners smiled and made introductions. “This is Xania,” said Deborah Jacobs, gesturing to her rescue greyhound. “We call her Xania the wonderdog.” A passionate reader herself, Jacobs volunteers her time so that kids without pets can enjoy time with animals while improving their literacy. About forty kids arrived at the event and took turns sitting on the floor next to the dogs and reading aloud to them. Many parents watched from the sidelines. Beverly Bingham was surprised by the event when she happened to come to the library with her son. Alyssa, a first-time attendee, sat next to a golden retriever and reflected on her experience. When asked if she prefers reading to people or to dogs, Alyssa didn’t miss a beat. Nora Boydell is an independent audio producer. She is currently interning for Atlantic Public Media.